Have you ever heard of “Sitting Disease?” It’s currently a hot topic in the scientific community and it sheds light on the ill effects of an overly sedentary lifestyle. Some experts even say it’s a metabolic syndrome, which means it is a risk factor for high blood pressure, high blood sugar, and unhealthy cholesterol levels. I have a lot of questions about this, and I’m left wondering … is there any research to back up these claims? Or is it complete hogwash? I mean, it does make sense that sitting for a majority of your lifetime (whether you can help it or not) isn’t exactly good for you. But is it really THAT bad? 1. Sitting increases the risk of death (this has been proven in four different countries – U.S., Canada, Australia, Asia 1). Sitting for six or more hours per day makes you up to 40 percent more likely to die within 15 years than someone who sits for less than three hours a day (Michael Hyatt). 2. Sitting contributes to obesity. Obese people sit for an average of 2.5 more hours each day than thin people do (Michael Hyatt). Sitting decreases the activity of an enzyme called lipoprotein lipase (LPL), which helps burn fat, so it make sense that sitting contributes to obesity. 3. Sitting jobs directly correlate with cardiovascular disease. People with sitting jobs have twice the rate of cardiovascular disease than people with standing jobs (Michael Hyatt). 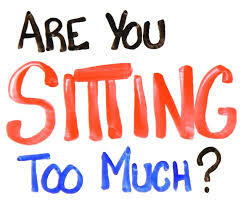 Excess sitting increases blood pressure and decreases the diameter of arteries, which makes heart disease more likely. 4. Women who were inactive and sat over six hours a day were 94 percent more likely to die during the time period studied than those who were physically active and sat less than three hours a day (American Cancer Society). 5. The negative effects of sitting are immediate, not just long-term. Effects that occur in your body within 24 hours of extended periods of sitting: the electrical activity in the leg muscles shuts off, calorie burning drops to one calorie a minute, enzymes that help break down fat drop 90 percent, good cholesterol drops 20 percent, and insulin effectiveness drops 24 percent (Michael Hyatt). 6. Men who were inactive and sat over six hours daily were 48 percent more likely to die than their standing counterparts (American Cancer Society). The results speak for themselves, and I’m convinced that prolonged, continual sitting truly is bad for us. Are you? I believe the time is coming when the medical community will recognize Sitting Disease as a diagnosable disease. I would guess that most people in the holistic/wellness community have already embraced Sitting Disease as reality and are already coaching and treating people in ways to reduce and overcome it. So, what are we to do if we are chained to a desk all day as part of our job description and source of income? It’s not like we can just quit our sedentary jobs, decide to go walking and hiking for a living and continue to have a place to live (if anyone knows of a job like this, I would love to hear about it!). If you’re looking for a solution, look no farther! Go check out ‘Are You Sitting Me? Part 2’ for some practical ways to get off your bum. I have to go move around now, I’ve been sitting WAY too long writing this post!